One of the many things I love about going gluten-free is that I have chosen to make my own foods instead of buying them pre-made. This way, I know exactly what ingredients are being used and what I’m putting into my body. For a super-quick dinner, try this delicious pesto sauce over gluten-free pasta and chicken. Delicious! In food processor, mix together first 5 ingredients until blended well. Transfer pesto to bowl and fold in manchego cheese. Pesto is great served over pasta, chicken, omelets, salads or tomato & mozzarella and it keeps for weeks. Just transfer to mason jar, cover with a layer of olive oil, cover and refrigerate. Switch out your mayo this BBQ season with a more natural version that doesn’t come from a jar! Place all ingredients in blender and mix together until smooth. While flipping through an old issue of Whole Living, I found a snack I hadn’t heard of before…Roasted Spiced Chickpeas. 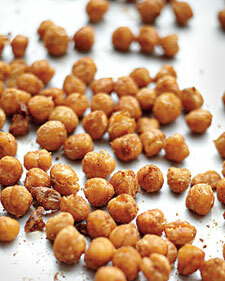 Hmmm…spicy, crunchy, healthy, and it involves chickpeas…I’m in! container up to 2 weeks. Then today is your day because it’s National Coquilles St. Jacques Day! In a frying pan over medium high heat, add butter, shallots and garlic. Sweat the garlic and shallots until they become translucent. Add the clams and mussels and toss everything together. Season with salt and pepper. Deglaze the frying pan with white wine, cover with a lid and let cook until the mussels and clams start to open. Strain mussels and clams and set aside, reserving the liquid (it will be used to make the veloute). In a frying pan, add 2 tablespoons of the olive oil and heat the pan until it is smoking hot. Season the shrimp and scallops with salt and pepper. Carefully place the scallops in the pan and sear, until golden brown on both sides. Remove from the pan and set aside. Add the shrimp to the same pan and saute until cooked through, about 4 minutes. Remove from the pan and set aside. In the same frying pan, add the remaining 1 tablespoon olive oil and let it get hot. Add the mushrooms and saute until they are cooked and most of their liquid is released. Season with salt and pepper. Remove the mushrooms from the pan and set aside. 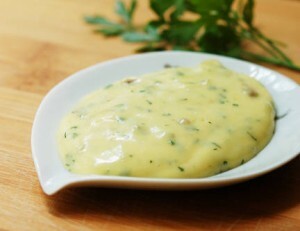 To make the veloute: In a saute pan melt butter and add flour until both mix evenly together. Let cook for a few minutes on light heat until the mixture resembles pancake batter. Take the pan you used to cook the shrimps and scallops and deglaze it with the liquid you saved from the mussels and clams and squeeze in the lemon. Add the fumet and let reduce. Add the cream and again let reduce over medium heat. Add the butter flour mixture and stir until everything starts to thicken. Season with salt and pepper and set aside. Remove the shells of the mussels and clams. Cut the scallops in 4 and remove any shell that is still on the shrimp. Add the mushrooms, scallops, shrimp, mussels, and clams to the veloute and stir everything with a spoon. 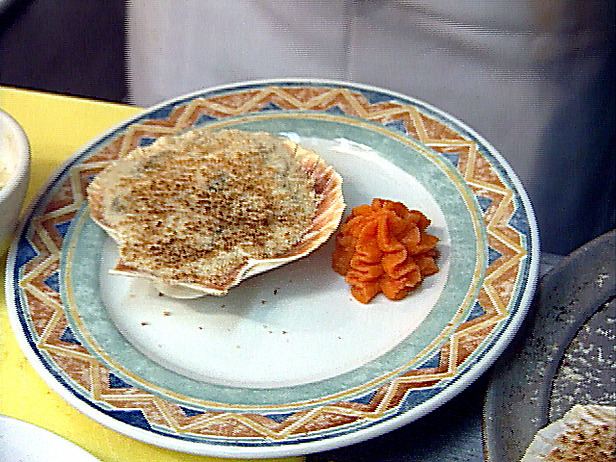 Fill the baking shells or bowls with the seafood veloute and sprinkle the top with bread crumbs and parsley. Place under a broiler until the top becomes golden brown. Place the hot dish onto another plate to serve.